The day I saw the hives, Stephanie and I swapped bee stories. Honeybee facts, statistics, jargon—this was our dinner conversation, while everyone else in the restaurant talked about the Pacers or something. We were eating Thai food that was abnormally hot. Yes, I know that Thai is known to be spicy, but this was so hot that I cried. 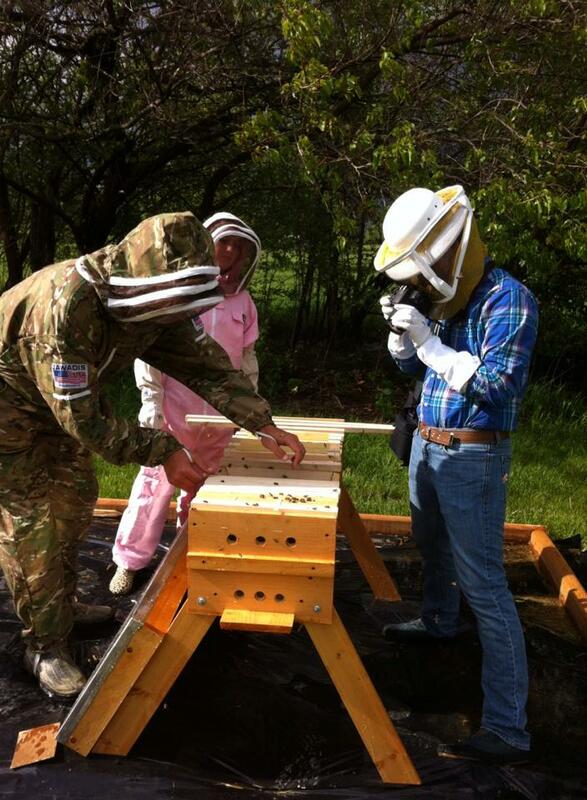 Matt and Tiffany show me how a Top Bar hive works. In it, the bees hang their comb from little slats on the ceiling, rather than in frames like the traditional Langstroth hives. Top Bar hives are supposed to be more natural, and they were created by missionaries for use in developing countries. The day before, the editor of The Reporter-Times called me to see if I could write some stories for the Sunday and Monday papers. Actually, he wanted to see if I was ever going to finish a story I’d worked on for the past two weeks. I assured him that I was just about to finish it. And I did. Most of the time, the deadlines make it happen. Anyway, he also asked if I wanted to take a story about a family that had taken up beekeeping. I jumped on it. Maybe I was too excited. But thinking about how cool Stephanie’s articles for Angie’s List magazine are and how interesting bees are, I wasn’t going to let this one get away. So I called the Crites family the next day and asked if I could come out to see their hives. Serena, the mom, said that I was more than welcome to come out anytime. And although it stormed all day, I arrived at their house during a brief window of sunshine. It was just dry enough for the bees to be active, and Matt, Serena and their twin, 17 year-old daughters Taylor and Tiffany showed me the hives. The Verroa Mite, neonicotinoid pesticides and a host of other threats are killing off honeybees and leading to colony collapse disorder, in which the bees leave the hive and never return for no one reason. Matt, an Army veteran and hunter, said he is not a crazy environmental activist, but the honeybee situation is a scary because pollination from honeybees is responsible for a third of all food. If you have a backyard, you have flowers, you want to help the environment and you want to help the bees, you can put a hive in your backyard for $300. And you don’t need to have that much space. Like our hives, they fly out three feet, see something interesting, then fly up and get it. There are lots of people like the Crites family who care about honeybees, as well as the environment, and want to do their part. You can get more information about local beekeeping groups at indianabeekeeper.com. But make sure to check out Stephanie’s awesome Indy bee story and national bee story, and take a good look at the graphics. And my bee story—“Family goes ‘apiary wild’ over honeybees”—is pretty good, too, if I do say so myself.